If you like animals and want some fun leggings then you should check out these bunny leggings. 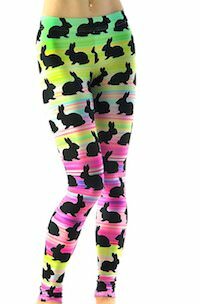 When you wear these leggings you are ready for easter as they are covered in rows and rows of bunnies and they are all black silhouettes and they stand out neatly because of the fun colored background with bright pink, yellow, and green. And you can get these Easter bunny leggings are available full length and as capri and it is available in many women’s sizes too so that you can get the perfect fit for you.